Every child custody and visitation case is unique. The information below is intended to give you a general overview of the child custody and visitation law and not intended as specific legal advice for any particular case. For a better understanding of your particular case and needs, we encourage you to call our office at 619-236-0533. California law supports the concept that, whenever possible, all parents should have frequent and continuing contact with their children. In most cases this means parents should be able to spend as much time with their children as their work schedules, the location of their residences and their own willingness to be available will allow. The right of parents to have a relationship with their children is fundamental under the law. This means that no court can make long term orders impacting the parental relationship unless both parents have strong due process protections. If you are married, in California you can file for divorce or legal separation to obtain child custody and visitation orders, but it is not necessary to do so. 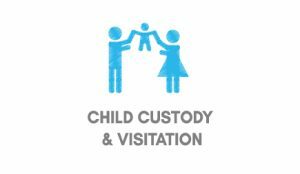 Although child custody and visitation orders are available to you in either a divorce or legal separation proceeding, it is also possible to obtain such orders, without the need to make the decision as to whether you want to divorce or obtain a legal separation, by filing a type of lawsuit which requests child custody and visitation orders. A custody and visitation only lawsuit is available to you whether or not you are married to the other parent. The law grants the same strong rights to parents whether or not they are married to one another. Absent issues with controlled substances, domestic violence, serious mental illness or other circumstances that might impact their health and safety, both parents are entitled to frequent and continuing contact with their children. The law in California is gender neutral. Because your rights are the same, the difference between married and unmarried parents is mostly about the technicality of the type of lawsuit that you file. Most parents who are not married will want to establish their parentage and custody rights through a “Petition to Establish Parental Relationship. This type of lawsuit will enable parents to get a court determination of paternity, in addition to orders for custody, visitation and support. Once you have determined and filed the type of lawsuit that is best for your needs, you will need to file a motion to obtain specific custody and visitation orders. By filing such a motion you will trigger a process requiring your attendance at a court sponsored mediation before the court gives you your orders in a separate hearing. Understanding how the mediation process works before participating in it is critical to your case. In San Diego County cases, if you are unable to agree in your mediation, your mediator will make a recommendation to the judge advising how you should share your children. We will help you to understand this process before you participate, including strategies and techniques for promoting an agreement with the other parent, as well as advice on how to present a reasonable proposal to the mediator if you are unable to agree. Our experience shows that such preparation increases your likelihood of a positive outcome. You will be required to participate in the mediation process whether you are seeking to obtain your first custody orders or you are seeking to modify existing orders.